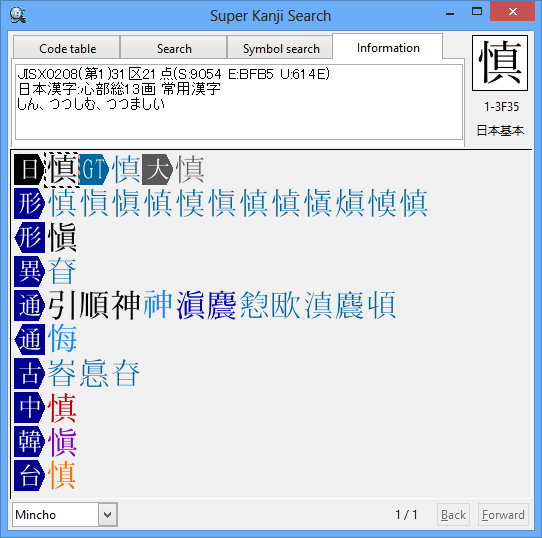 You can access a wide range of information on variant/related characters, including the list of similar-looking symbols and the correspondences between new character shapes and old character shapes, original characters and variant characters for names/places, Japanese kanji and Chinese/Korean kanji, Kanji and Tompa, Hiragana and Hentaigana. In JIS2004, the representative character shapes of some kanji characters were changed. 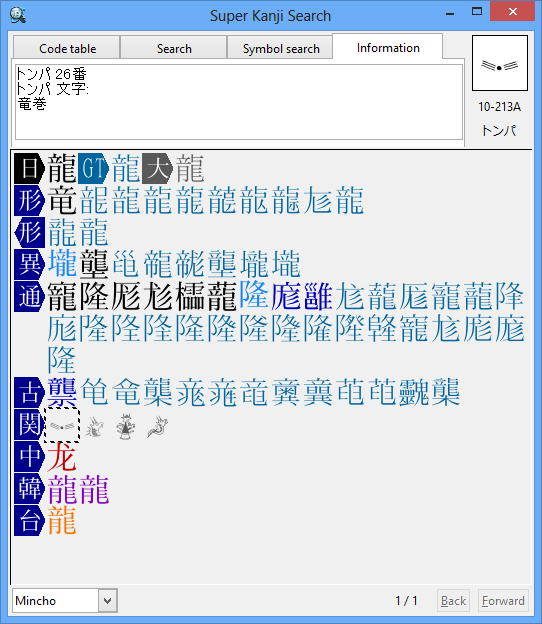 Regarding these kanji characters, both the changed kanji and the previous kanji are displayed as variant characters. 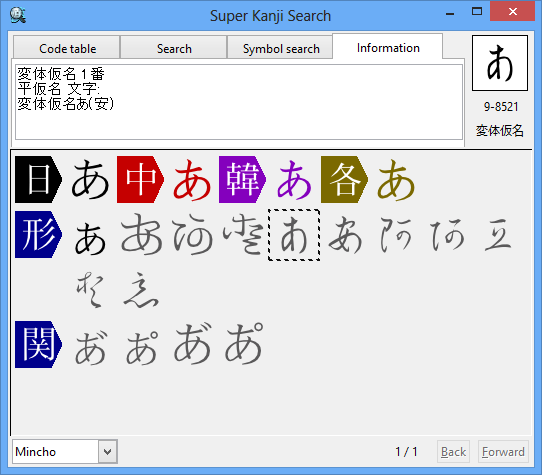 You can select the desired kanji between the changed shape and the previous one. 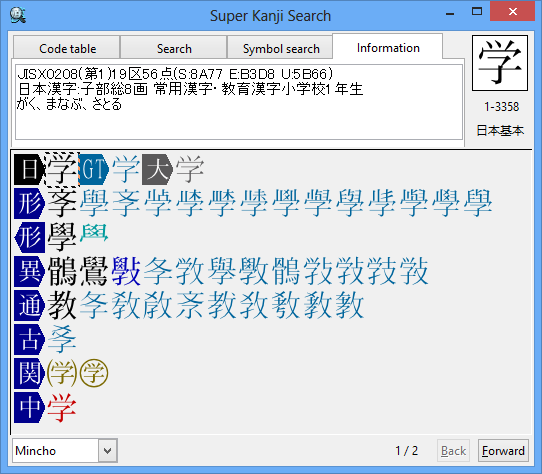 If you want to search the variant character or the old character shape for names, searching the variant character of well-used kanji is more efficient than searching the character by reading or parts. 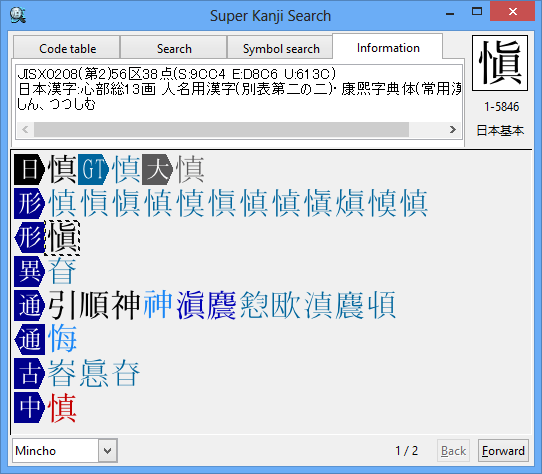 For example, the easier way of searching the kanji "愼" is inputting "慎" as the search criteria and selecting "愼", the variant character of "慎". Note: According to Article 60 of the Ordinance for Enforcement of Census Registration Act by Ministry of Justice, the following characters can be used for names. You can Confirm that Variant Character "愼" is the Kanji for Names. When you create a document or a website for kids, you can check whether the kanji you want to use is the must-learn kanji for elementary school students by The Ministry of Education, Culture, Sports, Science and Technology in Japan. If the kanji is the must-learn kanji for elementary school students, you can also check in which grade the students learn that kanji. You can check in which grade the students learn the kanji "学".